PUBLISHER'S NOTE: Gentle reader, you may be surprised to hear this, but I have no formal training in journalism. Until today (4/5/2018) I didn't really know the hard, fast distinction between an opinion and an editorial. Hard to believe, I know. To that end, when Mr. Dzombak asked if he could write this as an editorial I said sure. Upon reflection, Mr. Dzombak and I have decided to re-classify (and re-title) this piece as an opinion. Going forward, we are working to formalize Damn Arbor's ad hoc editorial board. I apologize for any confusion. The Y Lot is the former site of the YMCA along William St. between Fourth and Fifth Aves. downtown. 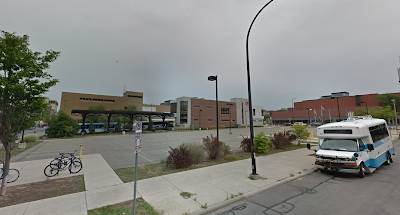 In this photo from Google Maps, looking northeast, the Blake Transit Center and downtown library are visible; beyond the transit center is the back of the Federal Building & Post Office. City Council member Jack Eaton's campaign committee was formed in 2010. From then through 2015, his campaign received $5,200 in contributions from members of the Dahlmann family. Eaton's campaign also received $650 from Dahlmann Properties' corporate counsel, Steven Zarnowitz. Councilmember Jane Lumm's campaign received $2,500 in total from the Dahlmanns from 2011 through 2015, and Sumi Kailasapathy's received $1,950 from 2012 through 2016. It is therefore unsurprising that, at the City Council meeting on April 2, Councilmembers Eaton and Kailasapathy voted against a resolution to spend $4.2 million of the City's general fund to buy the Y Lot from Dennis Dahlmann. Property developer Dennis Dahlmann is perhaps best known as the owner of the Bell Tower Hotel and the former owner of the Campus Inn. He sold the Campus Inn in 2015, the year First Martin broke Dahlmann's downtown hotel monopoly by opening the Residence Inn at Huron & Ashley. Dahlmann purchased the Y Lot from the City in April 2014 for $5.25 million. I'm not going to revisit that backstory here; you can read about this purchase in the Ann Arbor Chronicle (2013), this MLive article covers the current issue at hand, and Ed Vielmetti has gathered some additional, relevant information in his newsletter. The conditions for the sale specified that Dahlmann would develop the property and obtain a certificate of occupancy by April 2, 2018 — otherwise the City would have the option to buy the property back for $4.2 million. City Council now has the option to buy the property back, and on April 2, Councilmembers Jack Eaton, Sumi Kailasapathy, Anne Bannister, and Kirk Westphal voted not to allocate funds to buy the Y Lot. Councilmember Lumm was not present at the meeting. Councilmember Westphal made clear that he voted "no" so that he'd be able to bring the issue up at a future Council meeting, with all City Council members present. (This is a parliamentary procedure maneuver which I don't totally understand, but I'm not an expert here.) Westphal issued a statement on Facebook about the vote after the Council meeting Monday night. It's not clear why Councilmember Bannister voted "no." Her campaign has not received any campaign contributions from the Dahlmann family, and she told MLive she returned a $1000 contribution from Dahlmann last year. Her campaign has received $250 from Jack Eaton, $150 from Sumi Kailasapathy, and $150 from Jane Lumm. To get the 8 "yes" votes required to allocate funds for a Y Lot purchase at an upcoming City Council meeting, either Councilmember Lumm needs to vote "yes," or one of Councilmembers Eaton, Bannister, or Kailasapathy needs to change their vote to "yes." This is a critical issue because the Y Lot is now worth something like $10 million, depending who you ask. Were the City to spend general fund money to buy the property and then sell the development rights to a different developer, it would make millions of dollars. This is a clear financial win, with little risk to the City. City Council members have a responsibility to do what's right for the City and all its citizens — not to enrich their donors. In failing to buy back the Y Lot at $4.2 million, Ann Arbor would give Dennis Dahlmann a multimillion-dollar reward despite his failure to build a multi-use building in the heart of downtown, as he agreed to four years ago. In failing to pass this resolution, City Council would pass on the opportunity to allocate millions of dollars to affordable housing, crosswalk safety, and parks, or to less flashy line items, like shoring up the general fund & pension system. Instead, City Council would hand a seven-digit windfall to the private developer whose family & lawyer spent $10,000 on campaign contributions for Jack Eaton, Jane Lumm, and Sumi Kailasapathy. MLive reports, "Kailasapathy … said she has not taken money from any developers, including Dahlmann, in the last two elections." But in July 2016 — ahead of her victory in the August 2016 Democratic primary — her campaign received a $500 contribution from Bernard C. Dahlmann. Campaign finance records list his occupation as "Real Estate Management" at Dahlmann Properties. In May 2016, her campaign received $500 from Michael C. Martin, “Real Estate Developer” at First Martin Corporation. I could not find any record indicating that either contribution was returned. Councilmember Eaton told MLive he did not accept any money from Dahlmann or his associates last year. Campaign finance records agree, but I don't believe that turning down a check this election cycle leaves Eaton with clean hands: he's still accepted nearly $6,000 from Dahlmann & associates over five years. A "no" vote from Councilmembers Jack Eaton, Jane Lumm, or Sumi Kailasapathy on buying back the Y Lot is a corrupt vote. See the complete spreadsheet of contributions linked to the Dahlmann family, culled from the complete campaign finance records of all City Council members, here. If you are going to detail contributions from one developer to one set of candidates, you should examine the contribution patterns for all. There are many policy decisions being made by Council and if you think CM are being unduly influenced, how about an even-handed study? For example, Jeff Hauptmann, CEO of Oxford Co. (one of biggest property managers in Ann Arbor)has donated the maximum to Christopher Taylor for years, starting at least in the 2014 mayoral race. He has also donated to members of Taylor's caucus. The Tice family (Pizza House and major South U. developer) have donated hugely in the past. If you survey the Taylor caucus financial reports for recent elections, you will see many property managers, banks, finance professionals, etc. You are making a serious allegation - calling these council members corrupt. Merely receiving campaign donations does not make them corrupt. Have you considered the reasons they are advancing for their decisions? Are you confusing your own wishes for the objective truth? Dennis Dahlmann contributed to my 2012 council campaign as well. He called to tell me that he wanted to support my campaign and said very emphatically, "This is NO STRINGS ATTACHED! NONE!" You are demeaning a good citizen as well as conscientious elected council members. Try to be a little more thoughtful. > If you are going to detail contributions from one developer to one set of candidates, you should examine the contribution patterns for all. Yesterday, I looked for contributions from Dahlmann & associates to every member of City Council and to the mayor, for all of history. These three are the only current council members who have received such contributions. > There are many policy decisions being made by Council and if you think CM are being unduly influenced, how about an even-handed study? For example, Jeff Hauptmann, CEO of Oxford Co. (one of biggest property managers in Ann Arbor)has donated the maximum to Christopher Taylor for years, starting at least in the 2014 mayoral race. He has also donated to members of Taylor's caucus. The Tice family (Pizza House and major South U. developer) have donated hugely in the past. If you survey the Taylor caucus financial reports for recent elections, you will see many property managers, banks, finance professionals, etc. The next time Council makes a decision to enrich one of them by seven figures, with flimsy rationale that's immediately rebutted by city staff, I will. In the mean time, the Y Lot is the issue at hand. > Have you considered the reasons they are advancing for their decisions? I have, and I don't believe any are sincere. The closest to a reasonable explanation I've heard is from CM Eaton's recent Facebook post, where he broke the news that Dahlmann has offered the city a settlement in his lawsuit. I see little reason to settle the issue on terms favorable to Dahlmann at this point; it reads like he's trying to blackmail the city into letting him keep some fraction of the ~$1m he stands to lose. Most council members who haven't received campaign contributions from him seem to agree. > Dennis Dahlmann contributed to my 2012 council campaign as well. He called to tell me that he wanted to support my campaign and said very emphatically, "This is NO STRINGS ATTACHED! NONE!" The Dahlmanns are one of the reasons CM Eaton is on Council at all. In the 2013 election cycle — when Jack Eaton unseated CM Higgins — Dahlmann and co. contributed $2500 to his campaign (plus another $500 in December, immediately after the election). That’s no small percentage of the contributions that won him his seat. Would you tie Chuck Gelman's campaign contributions to city council members failure to act on the Gelman Plume? A bunch of them took money from Gelman over the years and ignored the environmental disaster. Or is that unthinkable? Just wondering how far you are willing to go with your assertions that campaign contributions = political influence. How about the Medical Marijuana Lobby? It's no secret that they give heavily to city council candidates. Do you think it's a coincidence that council members who received donations from "Clinic" owners paved the way for unlimited proliferation of pot shops? How about all the donations from DDA board members to Chris Taylor over the years? In your twisted view of the world it simply MUST BE that politicians are corrupted by their campaign contributions, so it would follow that Taylor does the DDA's bidding. You make some important points. One you left out is that you are working on Jack Eaton's campaign. If we expect Damn Arbor and Chris to be more transparent and frank about the facts, everyone should be held to the same standards. I am very disappointed in the discourse on this issue. Things that some council members have said, and this opinion piece, drag us into the mud that our national politics are currently mired in over the top of our waders. Conclusions are being made without evidence to connect the dots from the facts to the accusations. Further, I think this issue is not as simple as people want it to be, this author and council members included. Dahlmann has enough of a claim to get his day in court, which could tie this property up for a long time regardless of the outcome decided by a judge. The city doesn't need to get greedy. There are a lot of good things that could happen with this property, but it needs to be re-acquired without a messy and lengthy court battle. That should be the priority. The appreciation on the property leaves plenty of room for council and Dahlmann to work out a deal. Even if you don't like Dahlmann's claims, sometimes in business, you take the deal that lets you move forward, rather than the deal that looks more lucrative but might get dragged out for a long time. Especially in real estate, the market conditions, interest rates, and plenty more could all be different by the end of a drawn out legal battle. I think it is naive to simply vote to re-acquire the property, glossing over Dahlmann's claims, and think that will be the end of it. "Councilmember Westphal made clear that he voted "no" so that he'd be able to bring the issue up at a future Council meeting, with all City Council members present. (This is a parliamentary procedure maneuver which I don't totally understand, but I'm not an expert here.)" Likely via a "motion to reconsider the question" -- a member of the prevailing side (in this case "no") may, within one meeting of the question, move to reconsider an issue. If the motion to reconsider is made, seconded, and carried, then the original decision on the question is undone and debate resumes. It's powerful, but can only be made by a member of the prevailing side on the original decision, whether because of new information (or constituent pressure) leading to a change of opinion, or, in this case, the luck of voting last in a roll call vote offering CM Westphal the chance to realize the "no" side had already prevailed, and use his vote to maintain the right to make this motion. Thanks for the clarification, Murph. Hack writing designed to denigrate those who would speak for the people, and not the developers or the DDA, at the Council table. No doubt this article will be referred to many times in this election year, also no doubt that was the intent of the author. Sorry to see Damn Arbor waste electrons on this slanderous tripe, it's well below their usual standards. @Chris, I was the first local writer to delve into campaign contributions and connect them to votes on A2Politico.com (2009) and then in The Ann Arbor Independent (2013-2017). It's now become a common topic of conversation locally. That's a public good, in my opinion. Along with other conflicts of interest, knowing where our elected officials get their money helps voters make informed decisions. I'm glad to see you delve into campaign donation territory, but disappointed that you chose to do so narrowly in your piece. You expanded a bit in your follow-up comment, of course. You neglected to identify at Zack Ackerman's donations from developers Jeff Hauptman ($1400) and Alex de Parry ($250), or donations to Council members (Taylor, Ackerman, etc...) from UM Regents. You didn't ask why Chip Smith and Ackerman took thousands of dollars from out-of-town lawyers connected with development projects locally. You didn't connect those dots to other votes, and they need to be connected. As for Dahlmann and his donations, I have been frank with my friends on Council: I have discouraged them from taking such donations, in some cases successfully. I think it's as unwise and as unethical as taking money from UM Regents and taking drug money from marijuana dispensary owners. In reading the court filings and talking to Tom Wieder, the City Attorney's office has a lot of explaining to do concerning the inclusion of an underground connection use requirement in the contract when the connection never existed. Can't Steve Postema read a blueprint or hire someone who can? Former City Administrator Steve Powers played a role in this comic opera and Chris Taylor is responsible for composing some of that flawed contract language as well, via Council resolution. The contract required Dahlmann to make use of an underground connector to the existing parking garage. How could he? It's not there. The court filings make clear he worked for years to resolve this problem with City officials, but was not successful. Julie Grand, in an open meeting months ago, gleefully suggested the Y Lot property could be flipped for a profit. This suggests officials had an ulterior motive in refusing to resolve the underground connector issue over the past four years. No doubt Dahlmann's attorney will make use of the video of Grand's blunder. It's questionable whether the contract will be upheld in court as having been properly executed by Postema. Someone suggested to me today that perhaps Taylor, Postema and Howard Lazarus were so upset at the recent vote, because there's a behind-the-scenes buyer in the wings: Core Spaces. CP has not—a year later—signed a sales agreement for the Library Lot. Keep up the good work and keep connecting the campaign finance dots to votes for everyone on City Council. Pure intimidation. Here we have Chris Dzombak, Chip Smith’s friend, playing hachet man for mayor & co. What a sorry, desperate lot. Would Mr. Dzombak please show us the many RE brokers, attorneys, developers, etc. who finance their campaigns? @Gordon, this is a first person opinion piece misclassified as an "editorial" in an effort to let Chris (presuming Chris wrote this) have his say. He's obviously passionate about local politics and I say that's great. Whether he's a "hatchet man" is a question best answered by Chris's track record. On Damn Arbor, he writes cleverly and almost exclusively about computer science. His other piece about local politics was one that was intensely critical of Ali Ramlawi's campaign to oust Chip Smith in 2017. Chris posted this Dahlmann "editorial" on FB and Tweeted it out, as well. I didn't see links to many of his computer science-related Damn Arbor essays (better writing, really) on his FB or Twitter. I'd be interested in hearing from Chris why this is so, given that his comp science writing is much more clever than calling Ali Ramlawi a NIMBY and mistakenly using the word "corrupt" when referring to a vote. Frankly, I would be more inclined to point out that Chris works at UM and neglected to point out and question why CMs Taylor, Ackerman and Smith have accepted thousands of dollars in campaign donations from UM Regents. That first person essay would take courage and investigate new territory. This site's logo states: "We are to be feared." Glaring omissions such as Chris's suggests that, perhaps, Damn Arbor is to be feared because their writers may be a bit fearful of looking at all the facts and sharing the entire truth, which is what local voters need most. As a quick clarification, I did not delete Gordon's earlier comment. I think he did. It was the same as his 10:41 comment, except the earlier comment asserted that I was "Chip Smith's best friend" rather then "Chip Smith's friend." My sincere apologies, Chris. Just says deleted, not by whom. Unfortunately, either you don’t know the facts, or you have chosen to distort them. 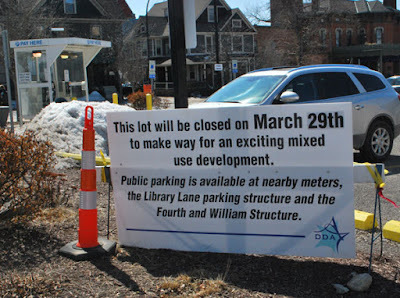 When the City sold the Y Lot to Mr. Dahlmann, it required him to connect underground to the Library Lane Parking Garage using “an existing obstructed below-grade City interconnection.” Based on a Planning Commission statement that the condition existed, he agreed to do so. The actual language about a “below-grade interconnection” came from then-Councilman Chris Taylor. When he subsequently discovered that the "existing...interconnection" recited in the contract wasn't actually there, he raised the issue in a letter to the City Administrator. This was in 2015. Two months later, the Administrator finally responded. He falsely stated that Council had given Site Plan approval for the interconnection. It hadn't; it didn't think that the assumed benefits of providing the connection were worth it, and rejected that part of the underground garage Site Plan in 2009. (Chris Taylor cast one of the votes to remove it, so he knew that it wasn’t there, or forgot) Construction would have required Council to reverse itself and decide to spend the money, after all. It has never even taken up the issue. The Administrator refused any extension of the deadline to complete a project. Then, the City sat around, doing nothing to fulfill its obligation to provide the interconnection. I suppose Mr. Dahlmann could have sued then, but he decided to develop a good project, present it to City and hope that it would take the interconnection condition out of the deal, since it would have had to spend about $3 million to build it.. He spent a year, in partnership with another company, trying to get approval for a very good project that wouldn't be required to use the nonexistent interconnection. The City Council’s response was to try to put even more special requirements on his development. The partner company gave up. That was in late 2016. About a month after that, Mr. Dahlmann offered a $500,000 contribution to the City's Affordable Housing Trust Fund (providing affordable housing was the main reason the City bought the property in the first place) in exchange for the City removing the interconnection requirement. He got no response. In July 2017, he increased his offer to $600,000. It was nearly a year after he made his first offer before the City summarily rejected his offers without offering any alternative solution. That was in late 2017. Mr. Dahlmann filed the lawsuit a few months later. It is pretty clear what the City's strategy was and is: Run out the clock on the development time limit, take back the property by paying Mr. Dahlmann a million dollars less than he paid for it, then re-sell it to another buyer for more. The deceptive, non-performing, greedy party in this story is the City. Clearly there's disagreement between the City and Mr. Dahlmann about the facts (hence the lawsuit). Regardless, thanks for stopping by to share your & your client's perspective on the situation. What Pat Lesko fails to mention in her comments here is that Jack Eaton's wife was on the Editorial Board of her newspaper. Just a little more "context" for your readers.